Posh Buckhead center sees first restaurant failure. 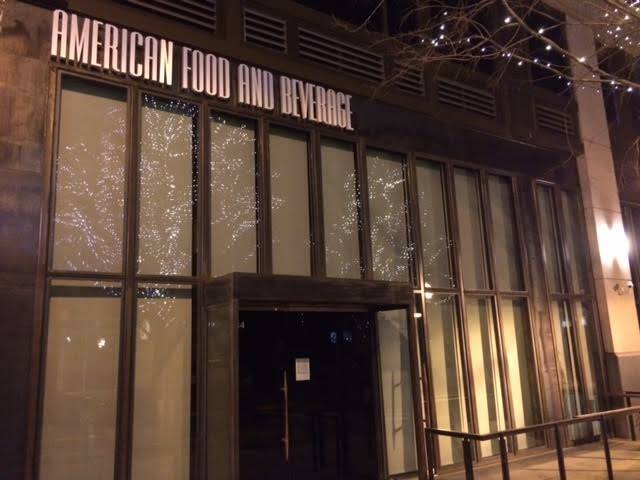 Dallas, Texas-based Raised Palate Restaurant Group has shuttered its year old restaurant, American Food + Beverage at The Shops Buckhead Atlanta. The restaurant, which officially closed January 14th, was one of two concepts the company, formerly known as the Consilient Restaurants, opened at the upscale Buckhead project. Sources indicate that AF+B was the slowest of all the TSBA restaurants, likely due at least in part to its location, at the corner of Buckhead Avenue and North Fulton Drive, easily one of the worst in the development. I ate at the restaurant twice and neither time was the restaurant especially busy nor was the food to the point where I was dying to return. The restaurant's closure comes on the heels of the group's closing of their original AF+B restaurant in Fort Worth's West 7th District this past September. 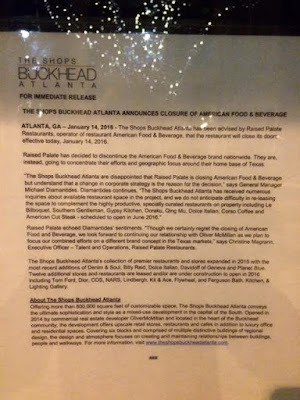 Following the Buckhead closure, a restaurant representative indicated that the company was "going to concentrate their efforts and geographic focus around their home base of Texas." Signage on the restaurant's door announcing the closure was rather formal for such a sudden closure, and came from the landlord, OliverMcMillan, rather than the restaurant itself. I was first made aware of the restaurant's imminent closure in mid December. At that time, it was expected that the restaurant would close at the end of 2015. When the restaurant remained opened into the new year, it seemed that the group had either changed their mind or renegotiated their lease to remain in business. If they did in fact renew, why not stay open at least through Valentine's Day, a day when even not-so-popular restaurants can do good business. In related news, the Raised Palate Restaurant Group website is down and has been down since at least last week, hinting at what could be greater issues at the fledgling restaurant group. 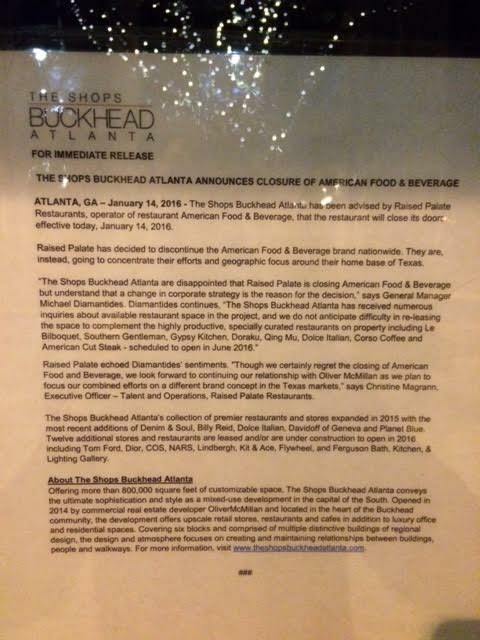 American Food + Beverage is the first restaurant in The Shops Buckhead Atlanta to close since the development opened in September 2014, but I'm confident it won't be the last, with at least three others likely to close this year. Raised Palate's sibling restaurant, Thirteen Pies, is also among those eateries in the project struggling, and will likely be the next to close, especially as corporate hones their "efforts" and "focus" on Texas. Other likely closure candidates include Doraku and Qing Mu, both owned by Steve Aoki and located on East Paces Ferry Road, along with Georgetown Cupcake, also located on East Paces. As I've covered previously, out-of-town restaurants, and especially those from Texas, have struggled in their attempts to break into the Atlanta market. Among them, Taco Diner, a concept from Texas-based M Crowd Restaurant Group, scrapped their plans to open (in midtown) altogether following disappointing sales from their existing midtown eatery, Mi Cocina. MAX's Wine Dive closed its midtown restaurant this past September after just over a year in business. The restaurant, part of Houston, Texas-based Lasco Enterprises, was located in the 12th & Midtown project in midtown. What is your favorite restaurant in The Shops Buckhead Atlanta? Why do you think American Food + Beverage closed? What would you like to see open in its place? Who do you think will be the next retailer or restaurant to close in the project? Editor's Note: I was away on a brief vacation this past week and apologize for the delay of some of my posts. Rest assured I have plenty of news in store for the coming week. They closed all AF&B locations and as you mentioned their parent website is down. Clearly an issue with the company as a whole. While easy to do, I wouldn't blame Buckhead Atlanta for this one. I ate at a Taco Diner when I was in Dallas. It was very good and I wouldn't mind seeing them give it a go in Atlanta. I just don't see many people getting out of their cars and walking around Buckhead Atlanta. Perhaps that's why this isn't working. Paces Ferry and Peachtree and Buckhead Ave really aren't conducive to walking. Myself, I'll park down the street and walk to Shake Shack and walk to Georgetown Cupcake but I don't see others doing that. Most of these shops don't have street parking and I have a feeling most people won't walk several blocks to frequent them. It'll be a shame if a place like Georgetown Cupcake closes. It really speaks to the larger issue that Atlantans just don't want to make an extra effort to walk. I ate there in October and it was just me and my guest. Food was decent. I tend to agree. Restaurants are early indicators of larger problems within the economy. Meaning discretionary spending gets cut back first. It's a house of cards economy stimulated by artificially low rates and liquidity pumping. It's got to fall at some point. The food was mediocre and their liquor cost must have been ridiculous. They had every liquor and brand imaginable but only used 25% of it. I also felt the name was incredibly generic. It seems more like the name of their restaurant supply company than the restaurant itself. I hope the corporate issues don't bleed into Thirteen Pies. I have been many times and enjoyed it. It is always quite busy too. What's the latest with Southern Gentleman and Gypsy Kitchen? I've never been to the latter, but I tried SG a few times, including after the chef changed. The food was fairly good. It was still very easy to get a table, but the bar was packed. Some of the retail shops have more foot traffic than others, but then you could say the same about the uber luxury stores in Phipps and Lenox relative to their neighbors as well. I don't shop in those stores, but the more down to earth stores--Warby Parker, Bonobos, etc. typically have large crowds any time I've been. A couple of weekends ago, I tried to shop in Bonobos, but it was too crowded. Who knows. I was in Southern Gentleman and Gypsy Kitchen at the weekend and both were packed with hour+ waits. Ate at SG, it was Ok not great. Preferred the scene at GK. I think the issue with Shops of Buckhead is that its hard to park and find the places. I didnt even know there was a Thirteen Pies or Cupcake place there! !